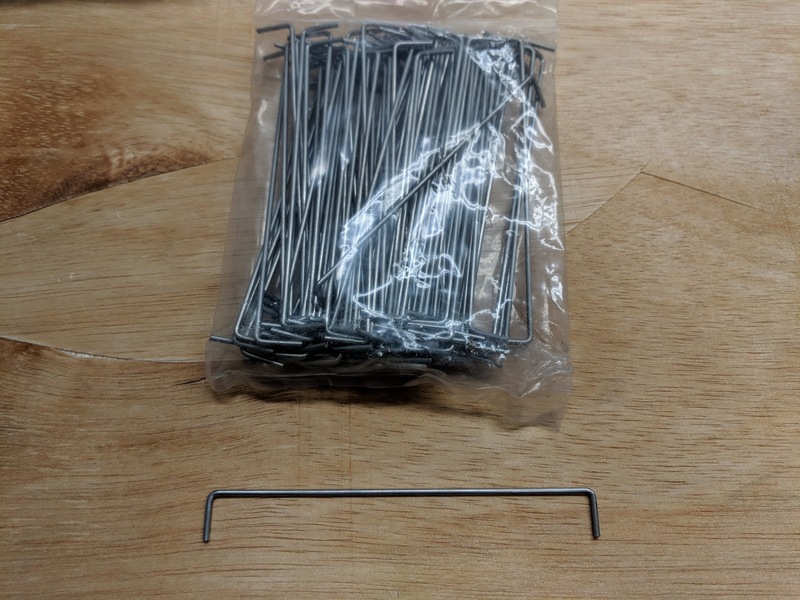 Bought 100 2U plate mount stabilizers for ~17 cents a piece. With shipping its about 25 cents each. 1 set of parts for a 2U plate mount stabilizer. 100 sets of 2U plate mount stabilizers. Mouser packages each part in a separate bag. Cost with shipping for 100 2U plate mount stabilizers, $24.69. If you have other things to purchase, like diodes, you can spread out the shipping cost. The descriptions on Mouser are not clear. 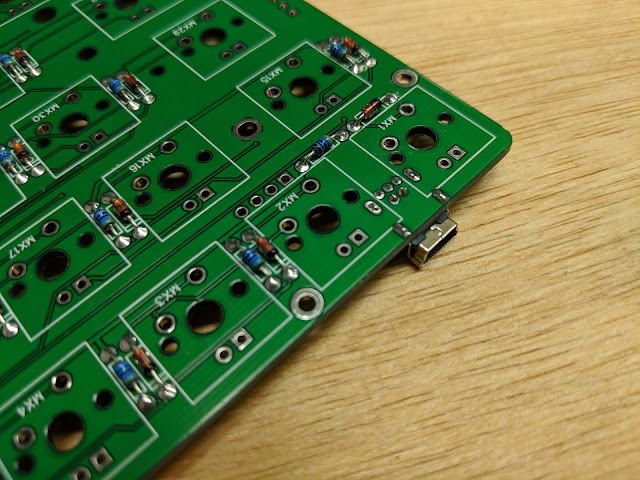 The part numbers for 2U Plate (without pins) and PCB (with pins) are in the datasheet. 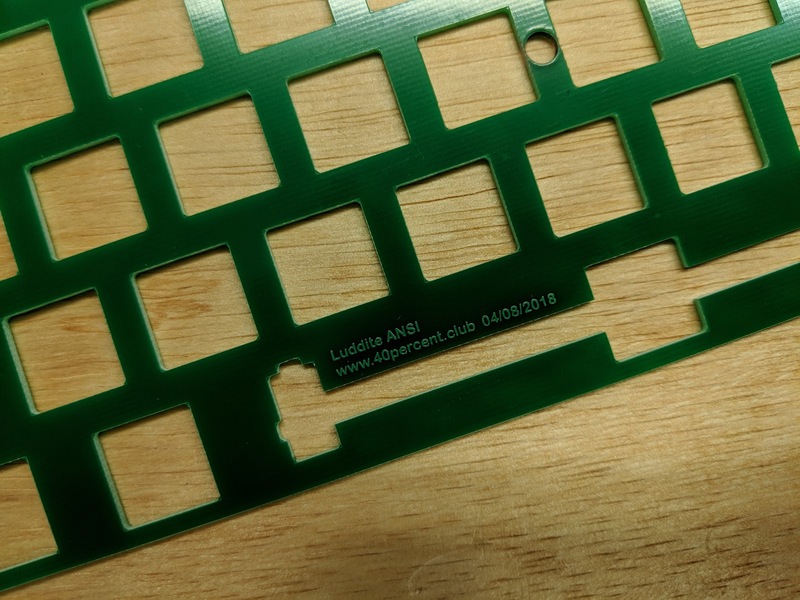 Mouser also has 2U PCB mount stabilizers in stock. For some reason they cost three times as much. Still much cheaper then purchasing them individually. 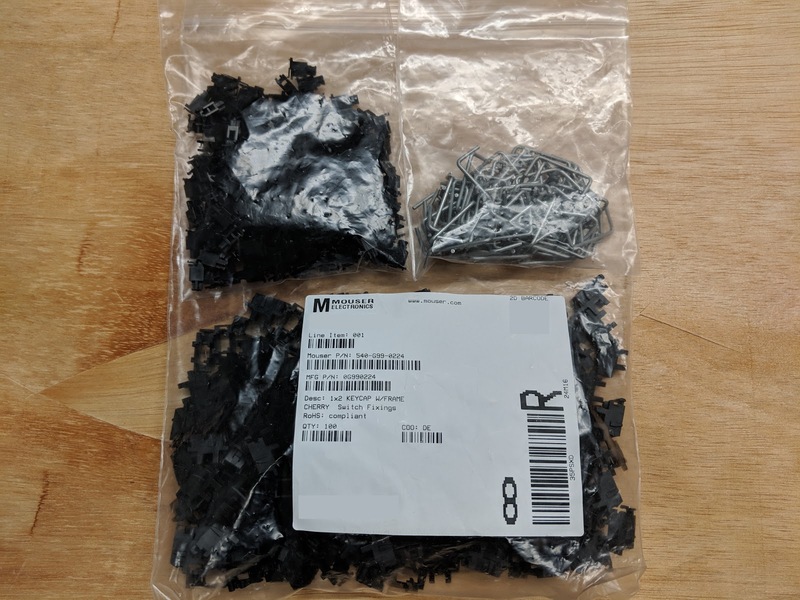 They come packaged the same way as the plate mount ones. I have purchased both types from Mouser. For the 6.25 spacebar I bought a 100 pack of wires from eBay. You use the same parts from the 2U set and replace the wire with the longer one. They also sell wires for other length spacebars. These will work with either the PCB or Plate mount stabilizers. Installed in a Luddite plate. Made a switch plate out of PCB material. 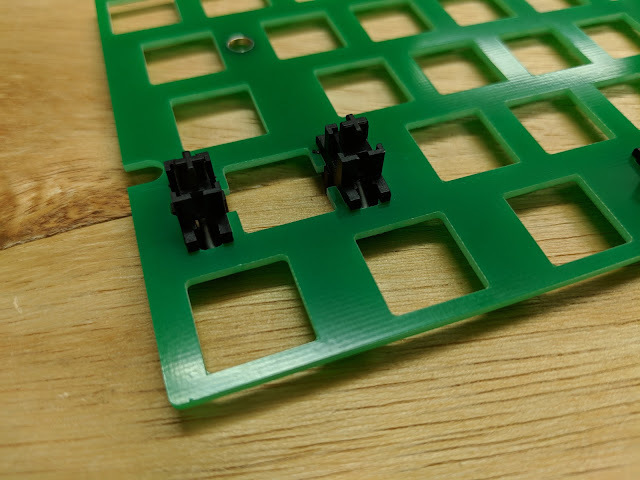 The holes are standard 14mm squares for MX compatible switches. I wanted it to be as strong as possible so did not use the cutouts that allows for switchtop removal. Standard ANSI layout, as the Luddite only supports ANSI. Plate mount Cherry stabilizers are required. I have only tested this with the Luddite PCB. Gerbers on github. 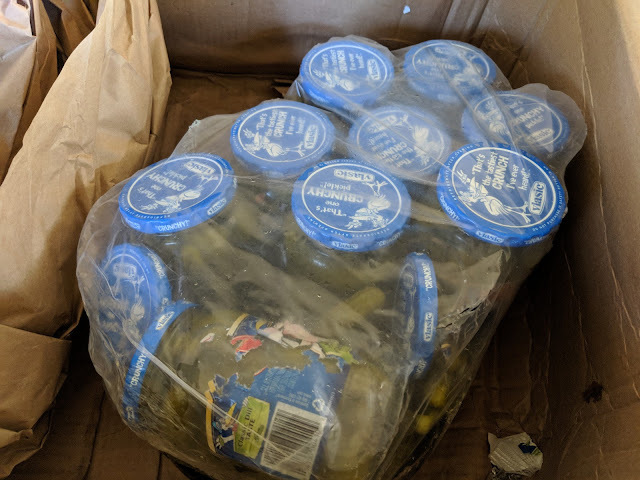 Found Gherkins on Amazon. This is what arrived. It was loose in a large box with several other items (That now smell like pickles). The only padding was the bunched up brown paper. 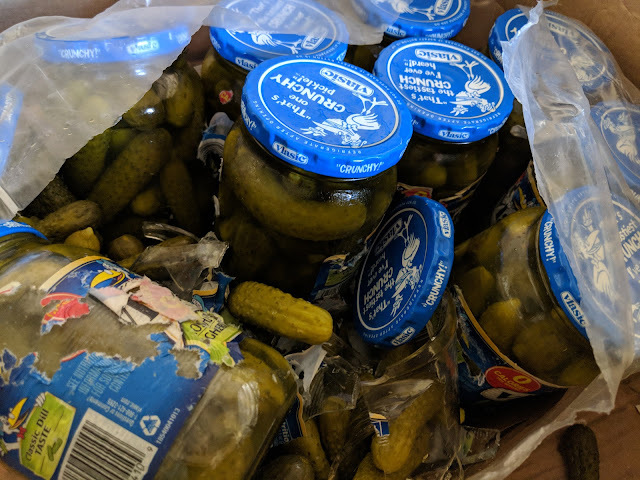 Gherkin gore. 4 of the 12 bottles were cracked open. There must be a trail of pickle juice somewhere. Second version of the Luddite. Fits fine in a cheap plastic case. 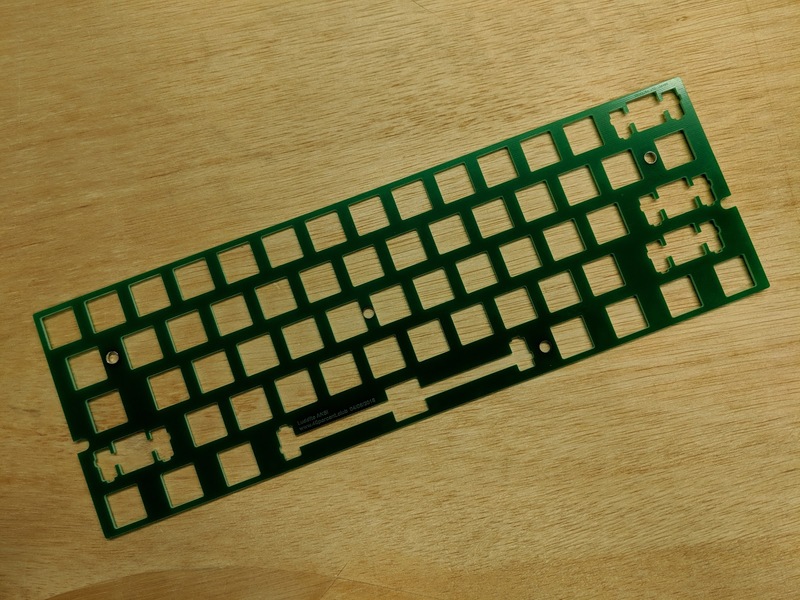 Or can be assembled with a second PCB as a base like the first version. The circuit is the same as the first version, some components were moved to avoid the stabilizers. Gerber file on github. Firmware. 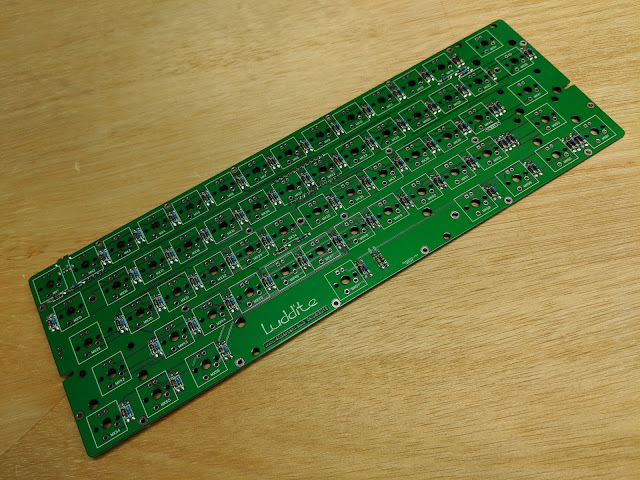 I made a PCB plate for the Luddite here. Luddite in a cheap $10 plastic case. Top of the assembled PCB. Diodes and resistors. 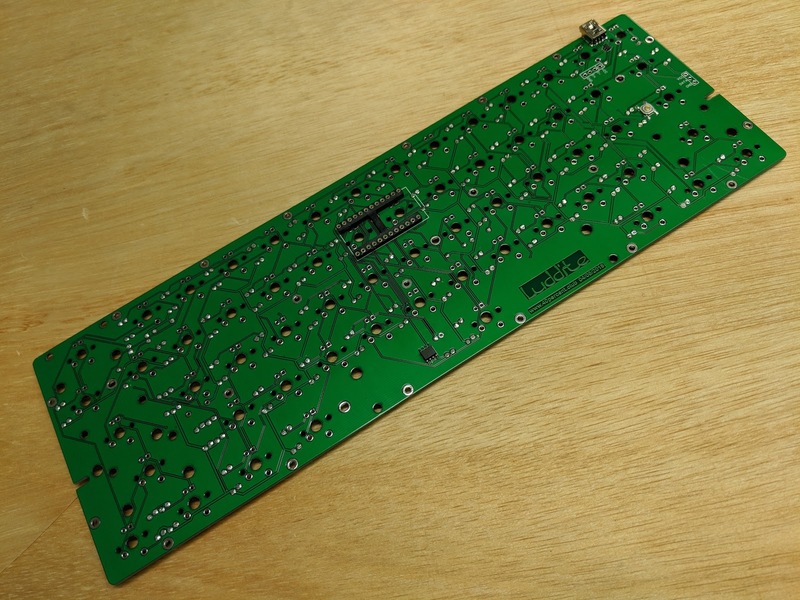 Bottom of the assembled board. 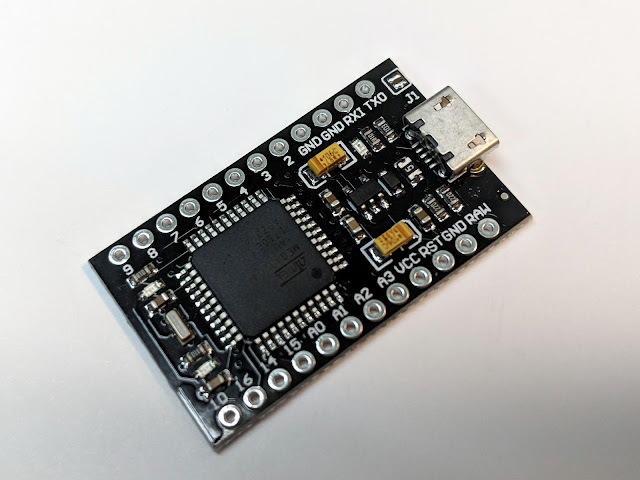 Mini USB connector, 24pin socket, and MOSFET for LEDs. 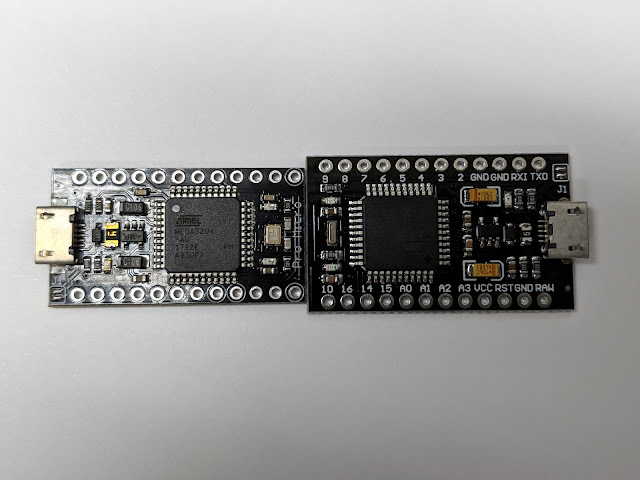 The tiny ESD protection chip is just below the mini USB connector. Closeup of the USB connector. 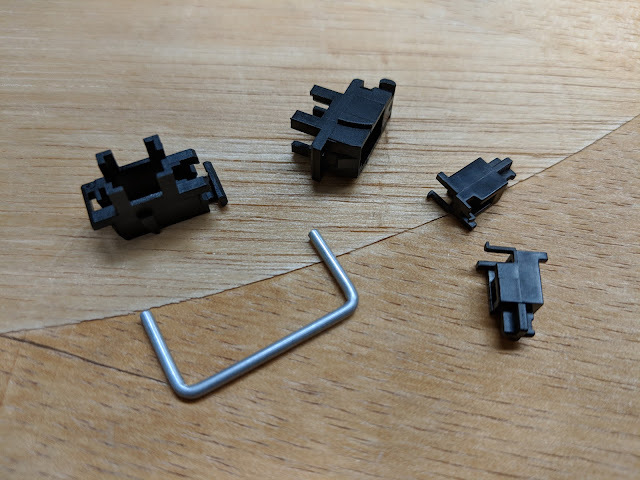 The 4 pads are for the pigtail to connect to the Pro Micro, in the same way as the GNAP! Another black Pro Micro that's not the right size. There are black Pro Micro's on eBay and AliExpress that are a different size than the normal Pro Micro. 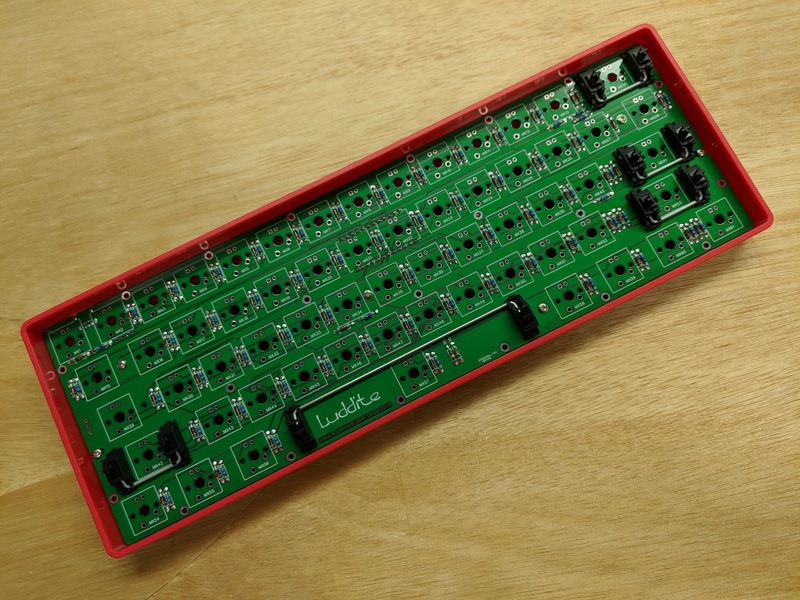 This makes it incompatible with any PCB designed for a normal Pro Micro. 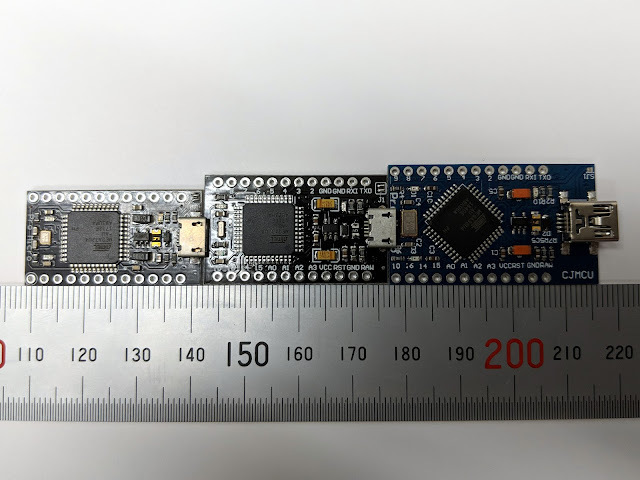 It's has the same pinout and the same circuitry, but will not fit. And yet another weird Pro Micro here. The top of the fat Pro Micro. 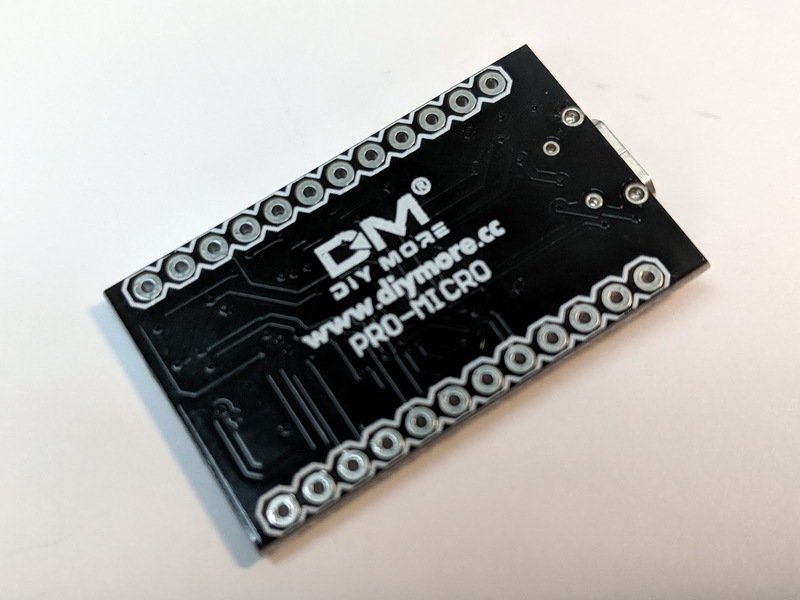 It is 0.1" wider than a normal Pro Micro. The only good thing is the type of Micro USB connector it uses has feet that fit into the PCB. It should be much harder to break the USB connector off. Bottom of the fat Pro Micro is flat. You can see the holes that the USB connector fits into. On the left is a normal size black Pro Micro, compatible with the common cheap blue ones. 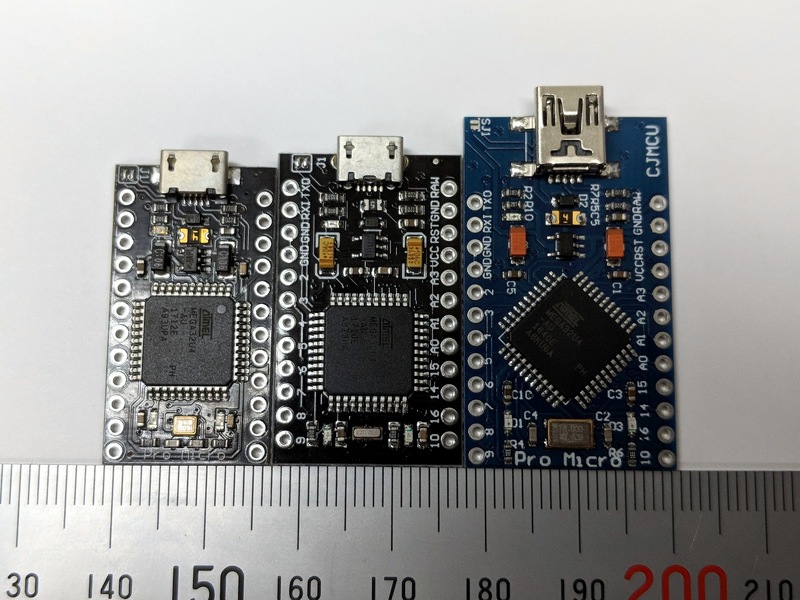 On the right is the fat Pro Micro. They both use the larger version of the AtMega32U4. Side by side comparison. Normal black Pro Micro, fat Pro Micro, Pro Micro with Mini USB connector.